Bakutoushi Patton-Kun (爆闘士パットンくん, Bakutoushi Patton-Kun? lit. Burst Fighter Patton) is an action game developed by Soft Pro and published for the Famicom Disk System in Japan in 1988. 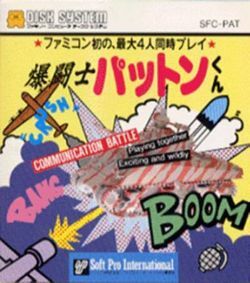 It is an overhead tank combat game similar in style to Atari's Combat game. It was the first FDS title to allow for four players to play simultaneously. In the game, players attempt to destroy one another's tanks. If a tank is destroyed, the driver of the tank will exit the vehicle, and must try to stay alive long enough for a replacement tank to parachute down from the sky. Game play continues until only one tank is the sole survivor. Then players advance to a new stage with different terrain. There are 56 stages in total. Despite referencing the name of American General George S. Patton in the title, there is no mention of him anywhere else throughout the game. The game also features a construction mode where players may design their own stages. Although the game was only release in Japan, the loading screen instructions contain English profanity. This page was last edited on 3 May 2014, at 04:28.